If you loved last year's Latitude E7250 and you want a newer chipset and a few less ounces, then give this a shot. But don't set your hopes too high. As business-class laptops begin to look and feel more like consumer devices, there's always one notebook within every manufacturer's portfolio that gets left behind. For Dell, the boxy, heavy and boring 2016 Latitude 7000 Series E7270 (starting at $1,079, about £755, AU$1,526) has this unfortunate distinction. Last year's Latitude E7250 was one of the best-looking business laptops we've reviewed. This year's model features a similar design with little improvement. Unfortunately for Dell, a lot has changed in a year, and laptop design has improved so dramatically that it's difficult to give the E7270 the same appreciation we gave to last year's model. Fortunately for you, what the 12.5-inch Latitude 7270 lacks in elegance it more than makes up for in under-the-hood hardware. This laptop is designed to withstand the rigorous computing needs of mobile workers in nearly every field. It's just too bad no one will want to be seen with it. Built with a black, woven carbon exterior that is unassuming in nearly every way, the Latitude E7270 feels nice to the touch. Similar to the palm rest on the Dell XPS 13, this rubberized material makes for a soft and cool landing place for your fingers. Unfortunately, unlike the XPS 13, the Latitude 7270's interior is made with plastic that feels cheap to the touch and was already warm after only 20 minutes of use. This behemoth of a "notebook" measures in at 12.22 x 0.74 x 8.47 inches (310.5mm x 18.85mm x 215.15mm, WxDxH). Its starting weight is a whopping 2.77 pounds (1.26kg), which doesn't sound too bad until you consider that this weight is for a non-touch screen and a 3-cell battery, rather than the touchscreen and longer-lasting 4-cell battery option. Yes, this is lighter than a mobile workstation, and it's a slight improvement on last year's model, but with so many slim notebooks hitting the market (see: HP EliteBook Folio 1040 G3), it's a shame Dell opted to birth such a fatso. If you're looking for a superior screen that can handle heavy-duty photo and video editing in 4K, look elsewhere. The Latitude 7270 can be configured up to only a full HD touchscreen. The screen is surrounded by a thick bezel that is undeserving of being in the Dell family, especially as the borderless Infinity Display finds its way onto Dell devices other than the XPS 13. Like the bezel and the laptop's interior, the hinges connecting the upper and lower panels lack imagination. Rather than leveraging the type of gorgeous slim, single-piece hinge you'll find on devices like the new HP EliteBook Folio G1, Dell opted for the old-school left-and-right silver attachments. Although it's not very nice to look at, the hinges are incredibly sturdy. Okay, so now that I've bashed the Latitude, let's give it its deserved props. Under the hood you'll find a sixth generation Intel Core i Skylake processor (up to Core i7) that's supported by up to 16GB of RAM. The Latitude can store up to 512GB of data, which isn't very good considering how big this thing is, but good enough to be your main computer for the year. The Latitude comes with a whole suite of connectivity options, from RJ45 10/100/1000 Gigabit Ethernet to an SD 4.0 Memory card reader, 3 USB 3.0 ports, an HDMI port, a SIM card slot, 3 M.2 expansion slots, and optional Fingerprint Reader and Lock slot. Also, optional are Dell's full range of endpoint software and hardware security tools, which safeguard your laptop from physical theft or cyber attacks. It is immediately unclear how long the battery will last on a single charge. For reference: last year's model lasted 9 hours on a single charge. Not bad. 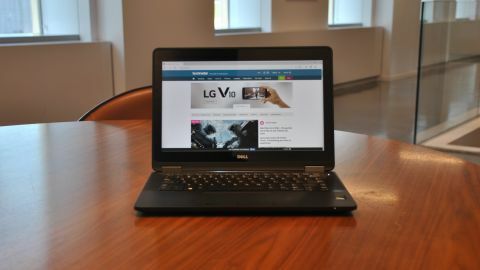 If you were a fan of last year's Dell Latitude 7000 Series 7250 and you're desperate for a similar device with a newer processor and a few less ounces, then you should definitely upgrade to the Latitude E7270. However, if you're looking for something sleek and elegant, something that pushes the envelope of laptop design while maintaining the Latitude 7000 series' traditional top-notch performance, then you should look elsewhere. The Latitude E7270 is a marginal upgrade over last year's model, one that doesn't seem to command a mandatory upgrade from loyal Dell consumers.